Members of Irish Army Pipe Band (actually the Air corps), originally uploaded by infomatique. 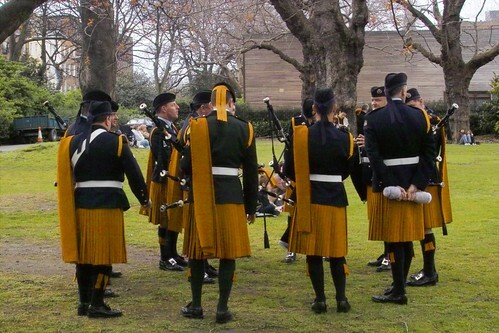 The Irish Army gave a number of performances in Stephens Green on Easter Sunday, 2006. Bagpipe performances were provided by some members of the Air Corps Pipe band seen above. The regimental head dress for the Air Corps Pipe band is a plain dark blue Balmoral. The cap badge is the musicians version of the standard regimental cap badge. * 2 x Air Corps collar badges (facing out). * Rank markings (lower sleeves). * Golden lanyard of the Defence Forces School of Music (over right shoulder). * Silver Pipers or Drummers proficiency badge (mounted on black) on the right arm. The Kilmainham brooch is another symbol of the ancient Irish Bagpiper.